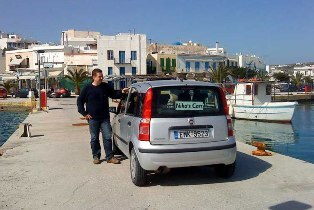 NIKOS CARS - RENT A CAR in Milos is located in Adamas, 100 meters from the port's peer, right in town. 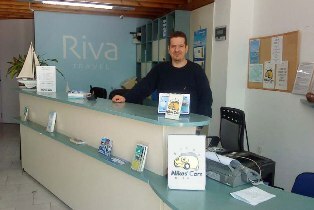 Nikos'Car office is inside his travel agency "Riva Travel", selling air and ferries' tickets. English is spoken. Niko's car rental in Milos Greece has a fleet of brand new or well mantained FIAT Panta 1200 cc., KIA Picanto 1000 cc., and HYUNDAI Atos 1000cc, small cars very suitable to tour the island, all air conditioned. 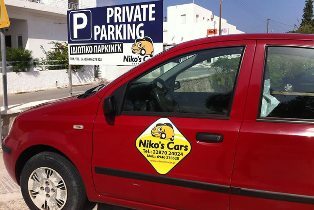 At Niko's car rental in Milos credit cards: AMEX, VISA and MASTER are accepted. The delivery of cars to and from the port/airport is free. Nikos cars are rented with full assurance or limited to third parties. Professionality and kindness qualify Nikos' activity and, of course, competive prices.